What advice would you give President Trump? Share by leaving a comment below. “Dear Mr. President, “Would you take this advice I hand you like a brother”? It’s a song lyric from the musical “The Pajama Game,” but fitting here. Thank you for your kind comments. You are not alone in this titanic battle against the spiritual forces of darkness. For the rest of our brothers and sisters, you do not understand the gravity nor the enemies of our Lord Jesus Christ. Unless you’re asleep, and if the Spirit of God is truly in you, you should have been aware by now that the forces arrayed against Trump and against the Christian communities, have craftily disguised themselves as wolves in sheep’s clothing. What we are witnessing in real time are the tares spoken of by Jesus in full harvest. If you don’t understand the parable of the tares and wheat, you need to brush up on the bible in Matthew 13:24-30. When tares and wheat are still young and immature, you can’t tell them apart because they look exactly the same. But near the close of the harvest time, you can tell the tares apart from the wheat because they turn completely black. You are intelligent enough to understand the metaphorical symbolism here. There is no grace for those who have an intense enmity against the children of God, and from those who literally drink the blood of little ones in communion with Lucifer. There is no mercy, no appeasement, no nice talk of reconciliation, and no compromise for the despicable wickedness against mankind. Again, unless you’re asleep, we are not struggling against flesh and blood, but fighting a spiritual battle against rulers, authorities, and powers of darkness. President Trump, I voted for you and would do so again. My reaction to Mr. Thomas’ article is that I would say “choose your battles”. Not every battle is worth a tweet. Anyway, if we let Him, God will fight our battles for us! Yes, you need to address some of the battles with your authority, but I would humbly ask no name-calling such as “dumb, stupid, dog, low IQ”, etc. This just gives the opposition fuel for their stance. (I consider their stance to be wrong, according to God’s word. Try to read some of God’s word every day, even if it’s just a couple of verses. We pray for God’s protection for you and your family and for God’s wisdom for you. You have a hard job, but I’m thankful we are under your leadership. Don’t give in; don’t give up and DON’T TAKE THINGS PERSONALLY. Just because something you do or say seems to activate the ire of others, it doesn’t mean that what you have said or what you have done has necessarily instigated it. Many times when we experience anger, jealousy, a sense of infringed upon rights or unmet expectations, we target a prominent person or scapegoat rather than blaming the seeming “injustice” on our own laziness, thoughtlessness, carelessness, ignorance or seeming helplessness. The LAST person we want to blame is ourselves. Instead, we blame, the rich guy, the successful guy, the handsome guy, the one who “stands out.” Because you are intellectually bright and financially successful, you may trigger increased thoughts of self-doubt in those of us who are insecure in our value, potential and purpose. And, most likely those thoughts originated in our childhoods, when we heard lies about our potential for success. But, there YOU stand — big, bold, and everything that represents achievement of the American Dream — the perfect TARGET!!! Don’t try to fight back; don’t try to outdo the insults and name-calling. Just keep doing the “right thing” and your remarkable achievements will speak for themselves! Dear President Trump. I and my husband and our prayer team at church pray for you daily. We know that the Lord has put you in this place and we see and understand all the good things that you and your administration have done. Unfortunately, some of the things you have been saying, especially the mean put-downs to some who disagree with you, have caused many to not see those accomplishments. I believe that you have accepted Jesus as your personal Savior and with that comes the indwelling of the Holy Spirit who counsels us, comforts us, convicts us and leads us into all truth. So many that I know love you and support you and we are making an appeal to you to please ask the Holy Spirit to help you regarding your reactions to people. We want what’s good for you and for our country. There is so much division, even in our churches, and we don’t need anything feeding into that. I hope you hear all of our hearts because we are for you and not against you. I wish you Shalom- the peace of God in all your days. 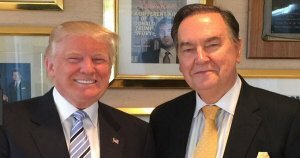 I pray with all my heart that President Trump will heed Cal Thomas’s words of wisdom. The President needs to be gracious and not respond in kind to his enemies. He can tell the truth without denigrating anyone. He should remain gracious and kind and quit giving his enemies such easy “material” to blast him. I even considered writing the same kind of letter to him but figured he would never see it. But maybe if ALL of those who basically support him would write the same type of letter and he got thousands of them, perhaps he would be alerted to take the higher ground and not stoop to the level of his enemies. I love your words Pastor Gary. they have greatly encouraged me. I have stood alone a long time with discernment that it did not seem i could share. I agree with the advice of Cal Thomas. I hope you will listen. You do not need to respond to others. Just focus on doing your job, which we so appreciate! The bible tells us to (16) Rejoice at all times. (17) Pray without ceasing. (18) Give thanks in every circumstance, for this is God’s will for you in Christ Jesus. (1 Thessalonians 5: 16-18, BSB). The New Living Translation says, God knows how often I pray for you. Day and night I bring you and your needs in prayer to God, whom I serve with all my heart by spreading the Good News about his Son. (Romans 1:9, NLT). Many years ago, I told those closest to me, that every single institution, office and the pillars of our society have been infiltrated and corrupted beyond measure and without comprehension. That also includes churches and religious denominations which will unfold in time. They thought I was crazy! Now here we are fighting an incredible battle against the unveiled enemies of state, foreign and domestic, and global powers who rule with impunity and aligned with the prince of darkness. As your prayer partners, patriots and ardent supporters of the U.S. Constitution, we understand the seriousness and magnitude that your office holds. We stand behind you, aside you, and around you in constant covenant prayer! There are many here in the Christian community that do not understand the depth and breadth of what is at stake in our beloved nation. Dear President Trump, may the words of your mouth and the meditations of your heart be pleasing to God. For He is your audience! He is the One you need to account to, may He strengthen you, may He be the One you cling to, He is your peace, He is your righteousness. Use this time as the leader of the country to do right in His eyes. I am grateful to God for bringing you into the position as President. Use this time wisely for His glory, speak words of truth in love. Building people up and not treating them with unkindness. God is for you, not against you. Thank you for putting in place those who trust in God. May He establish you and your family. Dear Donald, as my brother in Christ, hear these words to seek God’s wisdom and walk as Jesus did. While Jesus was often very harsh to His critics & enemies, He spoke with love to most people, especially to the weak, lost, and confused – I think many people in our nation are not your enemies; they just need to be shown the better way. Your words do stir up anger that clouds over your good works. I pray that you with find the best way to address every issue and passionately pray for your success daily. May the God of All Power & Wisdom give you grace and watch over you with great care! Lord, i would like to augment my first prayer. I want to thank you for our modern day Jehu, President Trump. He is a wrecking ball in your hand, Lord, he is bringing down the machinations of evil men and women, and perhaps there is no polite way to do this. May his zeal continue until all your foes in America are brought to their collective knees. In Jesus name, amen. Thank you Lord for this lovely exhortation. I pray that our President can receive it. I am so very thankful Lord for all you have allowed this President to accomplish, yet i can’t help cringe sometimes at what he says. I know you put him into office for just such a time as this, i just pray for him, i especially pray for his wife and family. Help our President to stay teachable, Lord our God. May he truly know you Lord, and walk in your ways. I ask a covering on him and his cabinet. In Jesus name, amen. Mr. President – I pray for you always and know that you were chosen by God in a such a time as this. One advice – throw your phone away. Mr. President, thank you for running for President. I supported for you, voted for you, and pray daily for you. I know you are being attacked from all sides, all the time. If I could advise you to do one thing, it would be be to be Humble. Cal Thomas’ advice was spot on! By using every opportunity to highlight the achievements of the administration rather than “punching back” at everyone who is critical you get valuable messages across to people who you need to support you and those who are running for Congress. It becomes tiring to explain to family and friends that they need to support you for your platform and overlook the off-putting of your harsh responses. Be quick to hear, slow to speak and slow to anger. but the mouth of the fool spouts out folly. James 1:19-20 (NET) “Understand this, my dear brothers and sisters! Let every person be quick to listen, slow to speak, slow to anger. For human anger does not accomplish God’s righteousness.” May you seek to follow the way of Yeshua HaMashiach in all aspects of your life and work. Thank you for your service. Mr. President, I thank God for the fact he gave America another chance through you as our leader. I pray that the body of Christ in this country does not squander this opportunity to ignite a revival through your efforts and bring this nation back as one nation truly under God. I do not know how you keep going after so many vile attacks against you and your supporters by the wicked left, but I suspect God has given you supernatural strength for such a time as this. So, all I can add to this comment is never cease to get on your knees and pray when you need help and strength to go on. I know God has anointed you to do a great work and so rely on Him fully to see it through. Don’t ever let the wicked left discourage you to give up. No matter how hard they try to bring you down, I believe their attacks won’t succeed if you keep doing what God has called you to do. Very perceptive Kate and well said. President Trump is, I believe God’s chosen vessel for this time. I too, like many others, pray for him daily. His is a heavy burden with great opposition. God chooses those who are right for the task at hand despite ourselves and grows us up through it. Mr President I hope you see the support in all the suggestions that have been written even if they seem to be in conflict. I pray that if you read any of these replies that you see and know that all is said from a position of love and not judgement, I don’t believe that anyone who has written is judging you, and if they are that’s God’s business. I believe that all of us pray for you and trust God that you will do as He leads. None of us are perfect and I believe that all the responses are words of encouragement and exhortation. We are all being changed into His image one day at a time. So I hope that you feel the love that everyone has for you. We all need to remember that the TRUTH sets us free, and much truth has been written here and I have gleaned from it. I pray that you do too! Mr. President, Daily thanking God for His care of you and yours Psalm 37:23 your steps continue to be ordered by the Lord. Galatians6:9Let us not become weary in doing good, for at the proper time we will reap a harvest if we do not give up. God does indeed make our enemies to be at peace with those that please Him,) Despite daily lies/distractions from the pit of hell; you remain focused;I can only imagine magnitude of truth behind new Space Force! Keep up the good work. We are thankful that God prepared you for such a time as this. God used his people to get you in and we will keep you in. As a newly born again Christian you do have rough edges. But who among us does not? Now you keep up the good work you have been accomplishing. We Christians have a tendency to judge from how we were raised or enfluenced. Don’t be confused by the divided opinions we Christians have. And be confident you will have the support you need to finish the work God as assigned you to do. In spite of our differences as Evangelicals, we totally know that without you at the helm we would not be “One Nation Under God, indivisible, and etc. So face life each day strong in the Lord and the power of His might. We surround you not only with prayer but our words of faith and life. Me. President, thank you for wanting to MAGA. In your desire to do this work it is necessary to keep your eyes on God. Would He be spiteful? Humble yourself before the Lord. Please be careful of your words, tweets. You would not be President if not for God. I support you, but I am unhappy that I think I must defend you because of your little boy attitude; “it’s my ball and I’m going to take it and go home”. Mr. President, ask to see the goodness of the Lord in the land of the living and respond to Him accordingly. Be gentle and firm in your responses. I have a question. How do you get anything done if you are constantly reading and responding to all the remarks? I am dismayed that so many people think they can improve on our president’s performance. Did notGod give him to us when we were on the edge of the precipice? DonaldTrump has strategies that we couldn’t possibly understand and he does not consider whether we like what he does or not. We all need to repent of our criticisms. Dear President Trump. I thank God for you every day and for our Godly heritage. My prayers for you are that God would give you wisdom greater than that of Solomon and strength greater than that of Sampson and Courage greater than that of David. I pray for Gods protection over you and your family. I also pray for you to be able to withstand the insults hurled against you. God is in control. I also pray that the schemes of our enemies within this country would backfire on them. I pray you will draw closer to God as I need to as well. I defend your policies every chance I get. Keep defending the sanctity of life and marriage and Israel. No other President in recent history has done that. Thank you for listening to Godly wisdom for wise and Godly advisors. I supported you and will continue to as long as you defend the issues that made America great. I know you love America and that’s what’s so important. We love you because you love America. MAKE AMERICA GREAT AGAIN. ❤️❤️And Melania is the best First Lady ever. Thank you President Trump for being willing to become our POTUS. You and your family have made many sacrifices to serve in this position. You have received much criticism just for being who you are. I pray for you, Melania, your children, and their families almost daily. I pray God will protect all of you and give you wisdom in every decision you make. Many of your supporters agree with Mr. Thomas and God’s Word in Proverbs 15:1 says, “A gentle answer turns away wrath, but a harsh word stirs up anger.” God Word is true. We love you and respect your courage to take a strong stand. We appreciate you keeping your promises. We want you to succeed in Making America Great Again. We desire to see our nation serve God as He has called us to do and for religious freedom to remain free in our country. May God richly bless you and your family and the USA. I pray everyday for you and your family, I pray that God will give you the right words and actions to overcome the hatred in our country and bring us back to being one nation under God. We see the results of taking God out of our country and schools, I agree with Sally, more honey than vinegar is in order. My husband says that you have to do what you do to get the truth out, but these petty arguments with insignificant people is not good. I do believe that God sent you at the right time to save this country Islamic take over, but please use some of the finesse you used to become the powerful man you are. Thank you for all you are doing for our country. I and others pray for you, your family & your administration. There have been so many wise statements today on responding to all the ugliness from the media & people. I cannot sat it any better. You are a man of great courage & wisdom & I also believe God placed in this leadership position. Cal Thomas said it well. Give God’s way a chance to deal with your enemies, let others see how to combat enemies by your leadership actions. Thank you for your positive attitude & love for our country. Shalom, shalom, Sandy. Above All Mr President Thank you for making America great again. Thank you for putting God back in the USA. America was founded upon God, and we the people should Not lose sight of that. Keep doing exactly what you’ve been doing, and forget these milktoast Christians. They seem to forget THREE HUGE facts. 1.When Jesus ransacked the Temple you notice there was not ONE Roman Centurion that we know was posted there that dared go up and manhandle Jesus. 2.When are these girly moderates going to learn if your enemies can’t appreciate what you have done, and promises you’ve kept, while everyone else that lies with a smooth forked and a smile has never once told the truth. 3. They ALL seem to forget that you’re risking your life, and the lives of family, not to mention putting your livelihood on hold FOR FREE while most of them play dialing for dollars on Christian TV. And something else they forget, you weren’t the one that got this country in trouble. It was the church not paying attention and voting for a bunch of sweet talking Progressives like Mitch McConnell and Paul Ryan. So,I say until they can do this job and do it for FREE, SHUT UP and let him do his job, and get on your knees and pray, and repent for letting this country get in the shape it’s in. Mr. President, God chose you for His purposes, knowing who you are and how you operate. He didn’t choose you so we could all tell you how you should be. I pray for you to walk in the wisdom of God. Please forgive all who think they know how to walk in your shoes better than you. None of us could have held up under the pressure you have endured. Only by the grace of God. I am thankful for you every day. You have a heart like David and you stand up to bullies when you need to. We have Goliath and company living in our midst and thank God there is someone who isn’t afraid of him. God bless America and make her safe again. I want to thank you for all that you are doing to make America great again. I know that God is with you for He has given you the ability to stand strong against the onslaught of the works of satan. It’s not an easy task to always remember that it’s not flesh and blood that we fight, but principalities, powers, and spiritual wickedness in high places, so I understand why you defend yourself and fight back, but there is a better way and it will be most beneficial for you and it will give glory to God. Let God be your defense, if God be for you who can be against you, vengeance is mine says the Lord, bless your enemies and curse not, pray for those that despitefully use you and abuse you, these are just a few strategies from God. There will be times for upfront and in your face confrontation as the Lord leads, but I believe that God wants you to trust Him with most of the attacks against you. Remember it’s not you they hate, but who resides within you. Satan is furious that his plan has been thwarted, and his minions are using many to destroy you, BUT GOD! God has given you the position of President of the USA and He will lead you as you remain humble and allow Him to defend you. There are many in this nation that are praying and standing with you against the evil that wants darkness to fall. Let peace be your umpire as you make decisions by doing that you’ll not react but respond in Godly wisdom. We love you Mr. President and most importantly God loves you, you can do this! These are excellent suggestions and Godly advice to encourage you daily in your effort to make America Great again. I also applaud the article which was thoughtful and well written. I pray daily that you would follow this advice. Seek God’s wisdom in each and every endeavor daily. Do not let Satan influence what you say on Twitter. He is all about tearing down not building up. But we know God is in control. He will have the final say. Not much I can add but I’ve found this to be true. “Let every man Be Swift to hear, slow to speak, slow to wrath”::::::another reminder from James (1:19). “For the wrath of man doesn’t produce the righteousness of God”(20) It really doesn’t. It just leaves more hurt and anger and the cycle continues, escalated. You are a man of decision and courage and it takes courage to leave the ring before someone is fatally wounded and words have that punch and power. When we are attacked and hurt we lash out without thinking BUT you were placed in this position” for such a time.” I pray you are given Courage under Fire and that includes the courage to restrain…In fact it’s very powerful! Untold numbers of people worldwide are praying for you, your family, your Administration, and this nation. Please take to heart what is being asked of you. My biggest concern is that your once strong voter base is being weakened by your twitter comments. I sincerely appreciate all you have accomplished to strengthen our economy, your tough stand on trade with China, and helping to promote religious liberty in what appears to be a hostile media bent on removing our precious freedoms. We are in a critical time with mid-term elections and my prayer for you is for you to respond to the constant attacks with wisdom and humility. Let your actions speak louder than words. God bless you and God Bless America! Please keep doing everything you are doing except lashing out like a wounded lion at every comment and insult. You can strongly confront people without stooping to denigrating them. How do you expect them to respond but with more vitriolic statements? Let’s keep it at the level of debate and lower the potential for violence in our country! Praying for you President Trump! I must agree with asking the president not to Twitter. The office of the President is an honorable position. I do pray always for a guard on President Trump’s mouth and that he would not react to negative comments in the way he has been. I pray that he spends more time in prayer and in the Word so that God can work through him. Please listen to the advice from so many that support you. You are making too many enemies with your tweets that tear down the people you don’t agree with. You must win this next election and you will if you listen to the advice of Christians and conservatives that voted you in as our President. but if you do not listen and repent of your ugly tweets, then more than likely you will lose the election and our country will continue to slide down a slippery slope until we are totally destroyed. I pray for you every day and know it was God’s will for you to be president at this time. I really am proud of you.God is so good.He works for our good if we love him.I think we should pray for the people that tries to ruin our country.Nothing happens that God dosent allow.Give people credit for good and pray for them that do evil.God is in control.we don’t win by cursing people. I am responding to my original message, I thought I was responding to Mr. Thomas’s message. Thank you Mr. President for your dedication and devotion to this nation you are doing a great job. Mr. Thomas’s advice is one that will win your enemies over. God bless you, may His face shine upon you and grant you peace. How can I improve or duplicate the wonderful comments made here. Yes, I am so thankful for the President God has given us. He continues to bless our nation. I applaud your strategy, you are building up not tearing down. Let the issues speak for themselves you have responded in a positive, encouraging, uplifting, manner that cannot be refuted. Because of the approach the issues can now be examined without an angry response. Thank you for all that you have done and are doing to help make America great again. America’s greatness is because the Lord God has had and still has His hand of blessing and grace upon our nation. As a nation we have strayed far from His path of instruction. You have helped to change the direction of our nation and continue to do so. Thank you for your tireless effort and for being a brave and corageous leader . Thank you for your service to this great country. There is not a better person for the job and I am proud of you and the great job you are doing. Mr President, you want this country to be great again, as do most others, and I want you to be a great president. Mr President, I support you and my suggestion to you is to refrain from lambasting those who would vilify you and your actions by maintaining a calm and dignified non response via Twitter or any other media. Being gracious is pleasing and winsome. Honey is easier to take than vinegar.